An awesome start to a new series by Sheila Roberts. This time our town will be on the beach, love the beach. Jenna is turning forty and getting a divorce from her deadbeat artist husband, and will now be a single mom of a teenage daughter. Her aunt has offered her a job at the Driftwood Inn that she owns, Jenna has wonderful memories from her childhood at Moonlight Harbor. Jenna decides to relocate there with her daughter, not knowing the Inn needs a little bit more work than she anticipated. Jenna will not give up! Loved the characters of this story, along with single bachelors all vying for Jenna, who really is not ready to step into the dating scene quite yet. Her daughter is the typical teenager, not happy with leaving her bestie behind. Once again Sheila has built a quaint little town that we will all want to visit. I highly recommend this book. 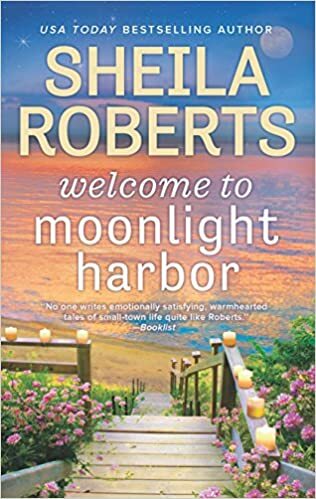 Welcome to Moonlight Harbor is a wonderful start to a new series by Sheila Roberts. There are so many words to describe this book. When one door closes another one opens. . . Forgiveness. . . Trust. . . Love. . . Family and friends. I loved every minute of this book and was sad for it to end. Well deserving of all five stars. You did it again sheila. Another good start to a new series, and its at the BEACH, whats not to love. This was a really good book and i can’t wait to read the others. Had some really good characters. I love Sheila’s books!!! !